Vance looking ferosh with his cousins. Somehow I do not have any pictures. Vance was a lion. I, a horrible mother. Vaughn's first Halloween. I was going to reuse the pea costume but I couldn't get her stuffed into it. The Chicken costume saves the day! We really got our money out of this Chicken costume. I didn't remember her wearing this yet again. Viva la chicken! A stink eye-giving butterfly and a blind-as-a-bat skeleton. You'll just have to wait. 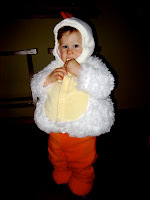 I promise the chicken suit has been retired for good though. I will for the first time be working with face paint. Awww what an adorable post! I wanted to let you know that I'm featuring you awesome Halloween lamp shades in my Make Yourself Monday post tomorrow! Please feel free to grab the 'I was Featured' button on my left sidebar. I think I have a picture of him as a lion. I will look when I get home and send it to you. Anxious to see this year!! !